Percepta’s Technical Hotline (THL) solution delivers an expert service directly to our Client’s Dealers, providing diagnostic information when they are faced with difficult vehicle repairs. Our teams act as a link between our Clients’ engineering department, and their front line Dealership network, combining Technical Support and Warranty Prior Approval to deliver an effective hotline service. Underpinning the solution is a clear set of guiding principles. Firstly, in line with all Percepta services, Customer (and Dealer) satisfaction are at the heart of everything we do. With this in mind, our THL solution focuses on helping dealers to “Fix it Right First Time” – empowering them to limit repeat vehicle repairs and cut down on frustrated customers. To deliver a truly joined up service to dealers, our THL solution is aligned with our network of Customer Relationship Centers (CRCs), and our case management philosophy. A “hub and spoke” approach, with the CRC at the very center, ensures that all requests for technical support are picked up quickly by either the THL or the CRC and are managed effectively to resolution. Finally, our THL teams across the globe collaborate and work together to share best practice, allowing our regional teams to demonstrate both local and global expertise. 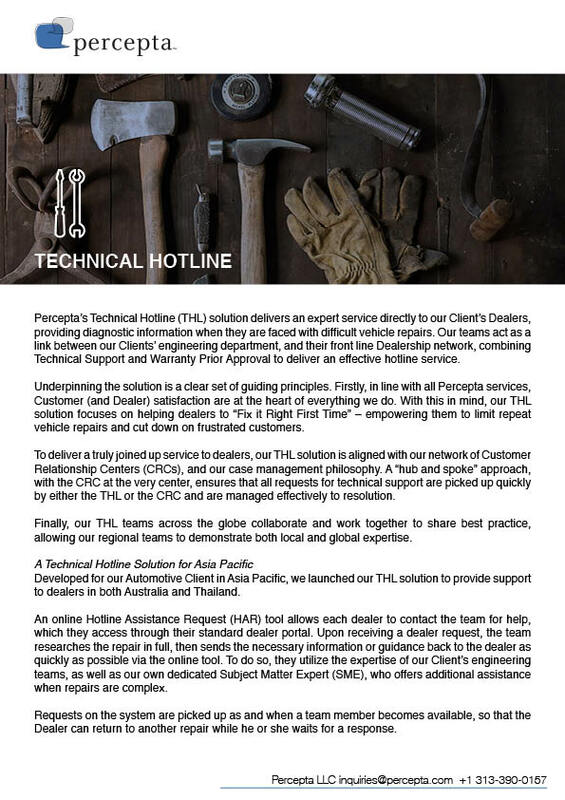 Developed for our Automotive Client in Asia Pacific, we launched our THL solution to provide support to dealers in both Australia and Thailand. An online Hotline Assistance Request (HAR) tool allows each dealer to contact the team for help, which they access through their standard dealer portal. Upon receiving a dealer request, the team researches the repair in full, then sends the necessary information or guidance back to the dealer as quickly as possible via the online tool. To do so, they utilize the expertise of our Client’s engineering teams, as well as our own dedicated Subject Matter Expert (SME), who offers additional assistance when repairs are complex. 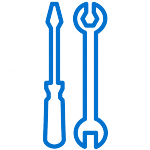 Requests on the system are picked up as and when a team member becomes available, so that the Dealer can return to another repair while he or she waits for a response. The team manages more than 4000 dealer requests per month. The success of the THL team hinges largely on their expertise and knowledge of vehicle repair, with the majority of our team demonstrating more than 10 years dealership experience. Our dedicated SME brings an extra level of expertise to the team, ensuring that we manage to resolve even the toughest of vehicle repair requests. To ensure the Dealer network has the means to “Fix it Right First time”, we closely measure their satisfaction with the advice and expertise they receive from the Hotline team. Each dealer has the chance (via email) to record their satisfaction with the HAR system itself, the quality information they received, the speed at which they received it and the impact this information had on the overall repair success. For us, this feedback is vital in not only understanding the success of the Hotline, but determining, in partnership with the Client, areas of improvement within the dealer network. Over the course of our partnership with the Client, our THL solution has received consistently positive feedback from Dealers and is recognized as having a considerable impact on Dealer repairs across the network.